The ability to create Home screen folders on the Apple TV is one of the biggest new features to appear in the recent tvOS 9.2 update. On previous versions of tvOS, apps couldn’t be organized in folders, which made for a cumbersome experience for those with lots of apps. If you’re an iOS user, then using folders on the Apple TV will be a largely familiar experience. In this post, we’ll show you how to create folders, move apps in and out of folders, rename folders, and more. 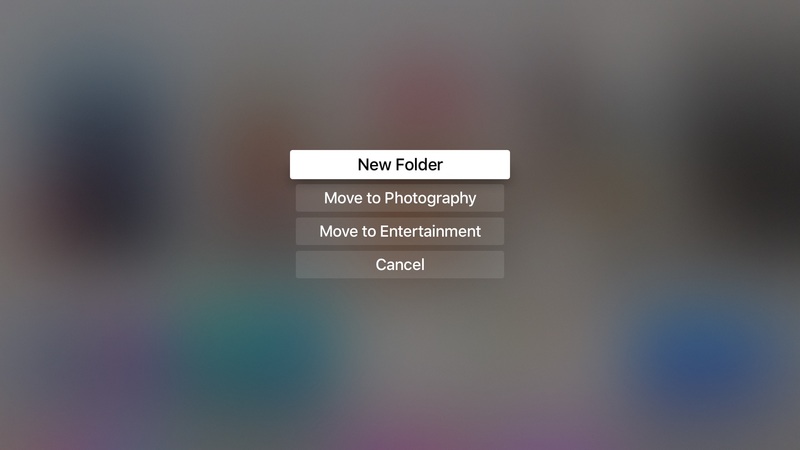 There are basically two ways to create folders on the Apple TV running tvOS 9.2 or higher. The first way is similar to the method that iPhone and iPad users employ to create folders, although there are some differences. Step 1: Highlight an app icon that you wish to move into a folder. Step 2: Press and hold the Siri Remote’s Touch surface until edit mode is engaged. You’ll notice the app icon start to wiggle. Step 3: Use the Siri Remote’s Touch surface to move the app icon on top of another app icon. You’ll want to select an app that you wish to occupy the same folder. Step 4: Once the folder is created, it is named automatically based on the contents of the folder. You can rename the folder by exiting edit mode (pressing the Touch surface) and swiping up to the name of the folder to use the keyboard. Siri dictation can be used to name folders as well. Step 5: After editing the folder’s name, press the Menu button or swipe down on the Siri remote to return to the folder view. To move more than one app into a folder, simply repeat steps 2 and 3, but instead of moving an app icon on top of another app icon, move an app icon on top of a folder. Apple has employed a more direct method for managing folders on Apple TV. This is nice for those using regular Apple TV remotes, or for those who prefer to avoid using the Siri Remote’s Touch surface to manipulate app icons. Step 2: Press and hold the Siri Remote’s Touch surface until edit mode is engaged. You’ll notice the app icon begin to wiggle. Step 3: Press the Play/Pause button on the Siri Remote. Step 4: Select the New Folder option to create a new folder. 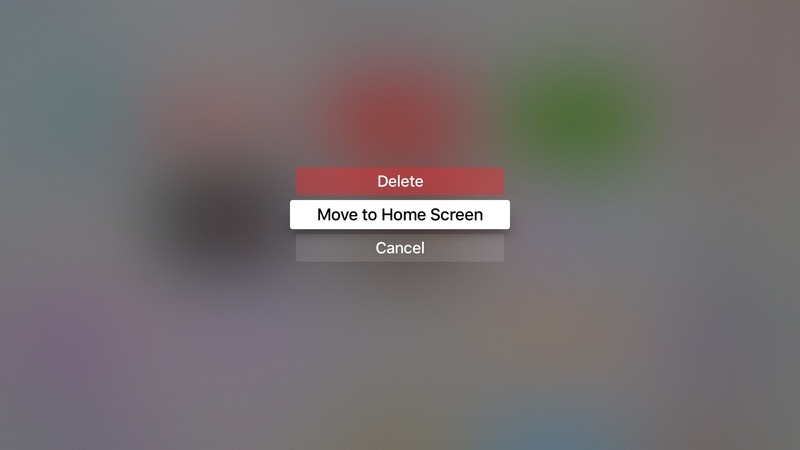 You can also use the “Move to…” option to move the selected app icon into an already existing folder, or back to the Home screen if an app is already inside of a folder. To delete a folder, simply remove all of the app icons inside of the folder that you wish to remove. Step 1: Open the folder that you wish to remove. Step 2: Highlight an app icon and press and hold the Siri Remote’s Touch surface until edit mode is engaged. You’ll notice the icon begin to wiggle. Step 3: Use the Siri Remote’s Touch surface to move the app icon outside of the folder (on the left or right side) and back to the Home screen. Step 4: Do steps 1-3 repeatedly until all of the app icons inside the folder are removed. Once the last app icon is removed, the folder will disappear. You can also press the Play/Pause button after Step 2 and select Move to Home Screen to move the app to the Home screen without using Touch surface swipe gestures. Creating and managing folders on tvOS is obviously inspired by iOS. That said, the process has subtle differences, and isn’t as straightforward as it is on iOS. Still, folders are a welcomed addition to the Apple TV, and do a good job of helping users keep their Home screens looking nice and tidy. As a side note, be sure to check out our tutorial for using Bluetooth keyboards with the Apple TV 4. Just like folders, Bluetooth keyboard support was one of the tentpole features for the tvOS 9.2 release. Also, be sure to check out Zac’s full walkthrough of all of the tvOS 9.2 changes.